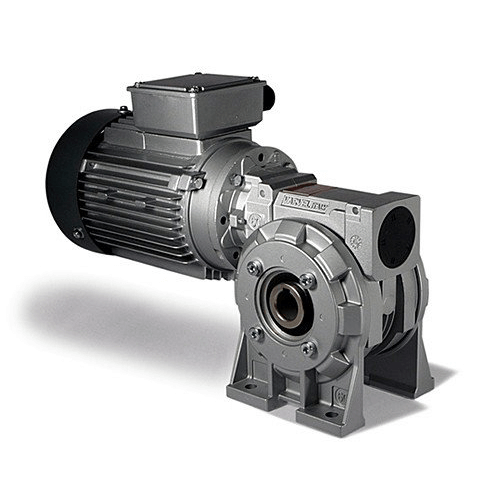 Motovario NMRV and NMRV POWER worm gear reducers currently represent the most advanced solution to market requirements in terms of efficiency and flexibility. The new NMRV Power series, also available as compact integral helical/worm option, has been designed with a view to modularity: low number of basic models can be applied to a wide range of power ratings guaranteeing top performance and reduction ratios from 5 to 1000. Motovario NMRV worm reducers have led the industry in design innovation for more than 20 years. By using aluminum housings, Motovario can produce worm reducers that are maintenance-free, have low occurrences of leaks, run at higher efficiency and are easier to handle than standard cast-iron worm reducers. Using two bearings on the input shaft, o-rings instead of paper gaskets and painting the reducers limits problems caused by leaks, corrosion and vibration. Motovario also hardens all worm shafts to improve efficiency and prolong reducer life.